When it comes to only-in-New-Mexico celebrations, Las Cruces delivers the Whole Enchilada (plus seven more). More than the calendar or even the thermometer, the aroma of roasting green chile announces the end of summer here in Las Cruces and its environs. When left in the field to ripen, the green peppers mature to scarlet pods that resurface in red-chile sauce and decorative, hand-strung ristras. 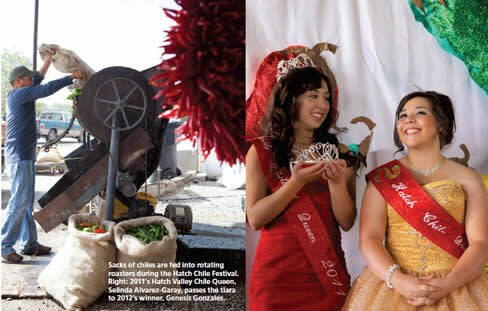 Like spicy bookends, two popular festivals devoted to these two shades of our beloved state vegetable—the Hatch Chile Festival and the Whole Enchilada Fiesta—begin and conclude September’s nonstop festivities. In between, avid locals like me (and our guests, of course) find plenty to celebrate as we toast the state’s grape harvest, thrill to hot-air balloons suspended above pure white dunes, and celebrate the region’s history and cultural heritage. This festival frenzy winds down but doesn’t stop completely, especially with Día de los Muertos just around the corner (on November 1). This four-day fest September 4–8. This fiesta, which commemorates Mexico’s declaration of independence from Spain, in 1810, begins in earnest when a parade with Mexican bands and floats arrives at the historic Mesilla Plaza. Tacos and gorditas sizzle, accompanied by rancheras and corridos played by mariachi bands. I never miss performances by the Ballet Folklórico de la Tierra del Encanto, headed by artistic director Jose Tena, whose bold productions go beyond traditional Jalisco dances. Tena, who has visited villages throughout Mexico, also presents regional folk dances, including heart-stopping choreography that features men performing intricate moves with cleavers. Chile chef Roberto Estrada will re-create his gargantuan dish for the 31st year in 2013. Preparing this three-layered monster, which measures 10.5 feet in diameter, requires 40 sous chefs and Herculean effort. Pamela Porter is a journalist who teaches at New Mexico State University in Las Cruces.